The first phase of the EU-project called Midway Alignment of the Bothnian Corridor will come to a close at the end of the year, but before that there are still numerous actions to be taken while getting ready to prepare for the second phase. – The Motorways of the Seas programme, to which the Midway project belongs, will hold at least four important international seminars this year and we have been invited to them. The seminars will deal with themes such as transport management, security and a global perspective on transport. As well as these, we will participate in the largest logistics event in Europe, ‘Transport and Logistics 2015’, in Munich. Together with Kvarken Ports, we will present the transport concept we have developed during this project and see how it is received by an international audience, says Riitta Björkenheim, the project’s Communication Manager. Finland’s parliamentary elections in April have offered a good opportunity to tell the candidates about transport needs in the Kvarken and what is required for their development. This opportunity has been well utilised. – We have toured all over with our brochures and received an exceptionally positive welcome. Candidates in the midst of their election campaigns have found the project interesting and I think they will keep it in mind during future government negotiations, Björkenheim says. – We have sought visibility at the EU level in cooperation with the West Finland and North Sweden European Offices in Brussels to promote our cause also in the European Parliament, the European Commission and among other important sponsors. 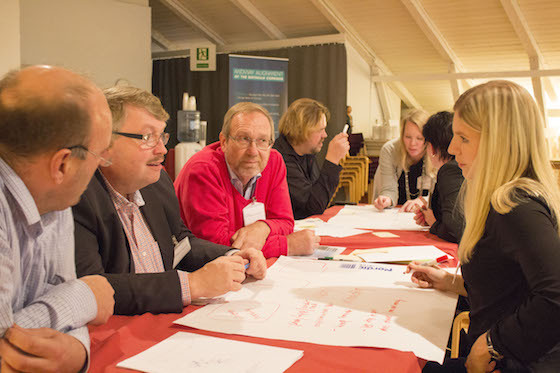 – Midway Alignment has also toured municipalities in both Ostrobothnia in Finland and Västerbotten in Sweden and organised information events about the project. It’s very important for the region’s municipalities and regional councils to receive up-to-the-minute information about the progress of the project so that they know they are a vital part of it, says Björkenheim. During the spring, several reports have been produced for the project which will help when moving on to its second phase at the beginning of 2016. – The second phase will be a lot more than just the building process of the ferry. The reports that have now been made about developing rail transport for industrial purposes, the space utilisation of both ports and making road connections more effective support the development of land infrastructure for the ports of both Umeå and Vaasa. In addition, the realisation of the whole concept will require that the traffic travelling to and from the ports is taken into account and that the circumstances affecting the storage of alternative fuel are considered.